Our Health Promotion Team has partnered with Heathmont College, who are committed to being a Health Promoting School. Part of this commitment is working towards being culturally competent. Further to requests from Heathmont College students to fly the Aboriginal flag, it now stands proudly next to the Australian flag. The flag is a strong representation of the school’s commitment to being a culturally inclusive school. 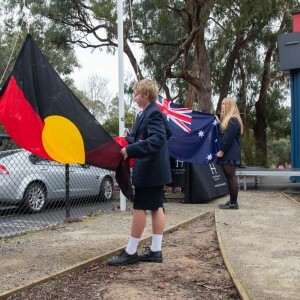 On Friday 4th August, Heathmont College had an Aboriginal flag raising celebration. 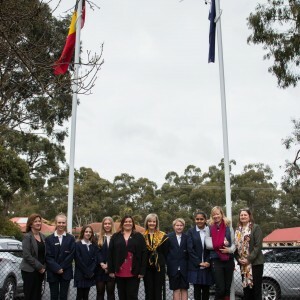 Aboriginal students, their families, Heathmont staff, local elders, community members and Heidi Victoria (local MP for Bayswater), celebrated the very first flying of an Aboriginal flag at Heathmont College. It was a special day and it being National Aboriginal & Islander Children’s Day made it even more special. 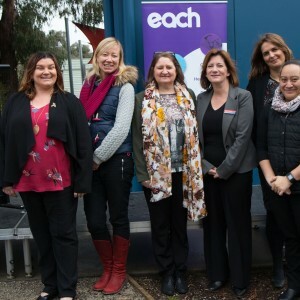 Thank you to the EACH Health Promotion Team for the funding of the flagpole, to Zoe Francis (Senior Health Promotion Officer) from EACH for organising the installation of the pole and in particular to Vanessa Murdoch, Aboriginal Health Promotion Officer at EACH. Thank you to the students who designed and ran the celebration, to the Mullum Mullum Choir for the beautiful songs in language, and to the local Aboriginal community for your strong support. Vanessa is a proud & strong Kullilla, Wakka Wakka & Gubbi Gubbi Aboriginal woman from nations in QLD. 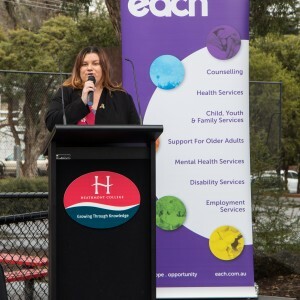 Vanessa gave a passionate speech at the ceremony about the importance of creating a welcoming, safe and inclusive physical environment at the school. Vanessa’s work at Heathmont College is ongoing. Together with Zoe Francis she runs a program with Aboriginal students, to bond together and embrace their cultural heritage. ‘I believe the Aboriginal flag creates a positive environment for aboriginal people, to feel empowered and to feel included in the community. It creates a welcoming environment for our school and makes the students proud to be at Heathmont College. By flying the Aboriginal flag, it is a sign of respect towards our people, by showing inclusion and acknowledgement to my aboriginal peers and myself and promotes a sense of belonging and pride for us in our school’. Learn more about our Health Promotion Service here.